Levi Veneziano, a kindergarten student at Richer Elementary, is proudly held up next to his drawing of fish and trees by his dad while mom takes a picture. 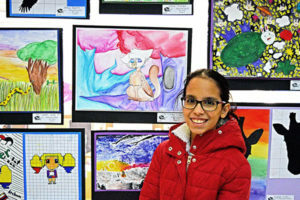 Marlborough – The 1LT Charles W.Whitcomb Middle School was filled with proud parents and smiling students of all ages April 4 at the annual Marlborough Public Schools “The Artist Within” Citywide Art Show. Artwork from students of the three city elementary schools, Raymond C. Richer, Francis J. Kane and Jaworek, adorned the walls downstairs while art from Whitcomb Middle School and Marlborough High School students was both upstairs and downstairs. 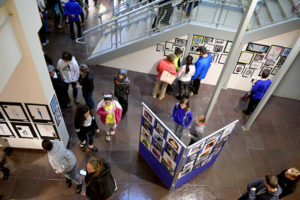 Everything from painting to pottery was on display as the district celebrated the artistic accomplishments of its students. Art activities were also available in the library for any little ones eager to demonstrate his or her artistic talents in person. A few student organizations took the opportunity to raise money for their clubs including the MHS chapter of the National Honor Society (NHS) which held a bake sale. Freshman Andrew Fisher is not yet a member of NHS, but hopes to be inducted in the near future and helped out at the bake sale table. 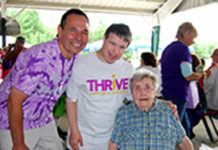 He had four works of art on display including a mandala which he was most proud of, he said, because of how much work went into it. 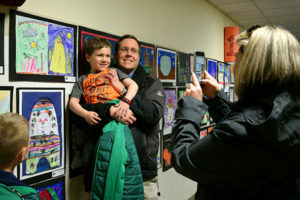 Cameron Allain, a second grade student at Richer Elementary School, and her mom Megan, look at some of the art pieces created by high school students. Luisa Vitoria Vieira, a sixth grade student at Whitcomb Middle School, stands proudly by her artwork. 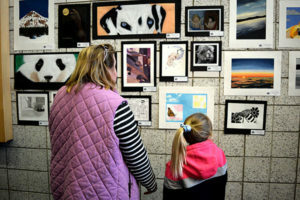 Students and families enjoy the artwork created by students from Marlborough’s five schools during the district’s annual Citywide Art Show at Whitcomb Middle School. 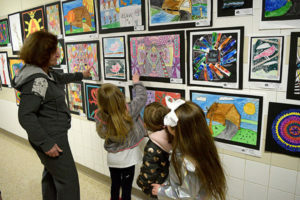 Three girls eagerly point at their artwork in the hallway of Whitcomb Middle School during Marlborough Public Schools’ annual Citywide Art Show.